Off shore oil rigs dictate a special need for detailed cleaning. It is important, however, that the cleaning method be safe simply because of the dangerous areas that are being cleaned. Off shore oil platforms require the use of an explosion proof power washer for added protection for the employees and the oil platform. Explosions are one of the greatest dangers on an oil rig, simply because of the flammability of oil and the fact that you are in the middle of the ocean. What do you need to know about explosion proof pressure washers? Keeping the off shore oil platforms free from sludge, oil, grease, and salt buildup is very important to keep the oil rig working efficiently and safely. Combining the pressurized water with specialized detergents helps to dissolve the dirt and debris to keep the oil rig clean and safe. The specialized chemicals that are used to clean off shore oil platforms are safe for the water and the environment, which makes them ideal for this particular use. An explosion proof power washer combined with a safe detergent can make cleaning those substances off of your off shore oil platform quick and easy. To clean off shore oil rigs an explosion proof pressure washer that gives at least 3000 PSI is needed. A temperature of at least 180 degrees Fahrenheit is required to dissolve the different substances that are found on an oil platform to completely remove them. By going back and forth between cleaning and rinsing, the pressure washers will be able to get the oil rig clean to keep it safe. Doing three to four foot sections at a time will allow you to concentrate on cleaning just a small area, so that you can get rid of the oil, grease, and other dirt. Cleaning for 10 to 15 minutes at a time and then rinsing will do the job quickly and efficiently. Explosion proof pressure washers are specially made to help prevent the danger of explosion. These pressure washers have explosion proof components and a heavy duty, cast aluminum, sealed enclosure to help meet safety standards to keep employees safe from explosion and harm. This explosion proof power washer meets OSHA standards of safety as well as meeting the NEC (National Electric Code) requirements. Explosion proof pressure washers produce no open flames, exhaust, or fumes to prevent any explosions and keep the employees safe and the oil platform working efficiently. 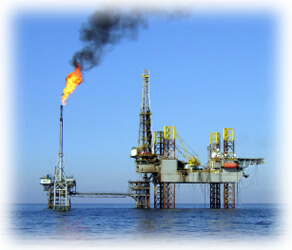 Explosion proof power washers help to keep the off shore oil platforms safe for employees and oil platform itself. Removing the dirt and debris that is normally associated with an oil platform is essential to prevent slips and falls, as well as helping the oil rig to work efficiently. Safety is of utmost importance on an oil rig due to the nature of the work and the location of the work. By removing the grease, oil, salt buildup, and more from the off shore oil platform, the rig will be safer for the employees and it will continue working efficiently.